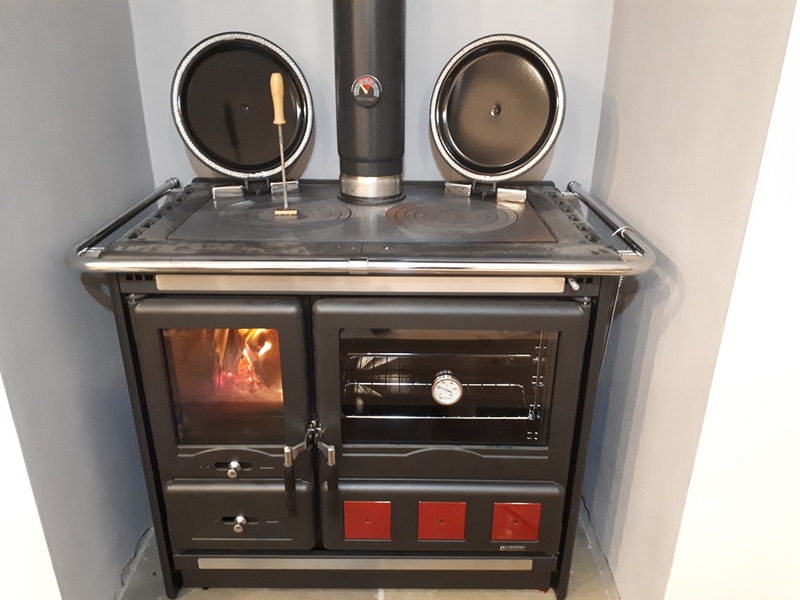 Last week I started to experiment with cooking on our new wood stove. I love it already, even though we're not in the new kitchen yet I've been keen to use it, mainly for heat but having the oven right there has meant I've wanted to try it. I had a group of friends over on Friday, so on it I cooked carrot soup and some bread rolls in the oven to make a nice lunch for everyone. It performed brilliantly. I had to turn the rolls round once as it's hotter on the side closest to the fire box, but other than that it was easy. Later, after school pickup, I decided to try a new cake recipe I'd seen (4 ingredients), I stoked the fire back up and shoved it in. Trouble is fruit cakes take a while to cook so I tried to cover it so it wouldn't catch on the top. When I pulled the cover off half the top came with it, then when it went back in the cake burnt on top. 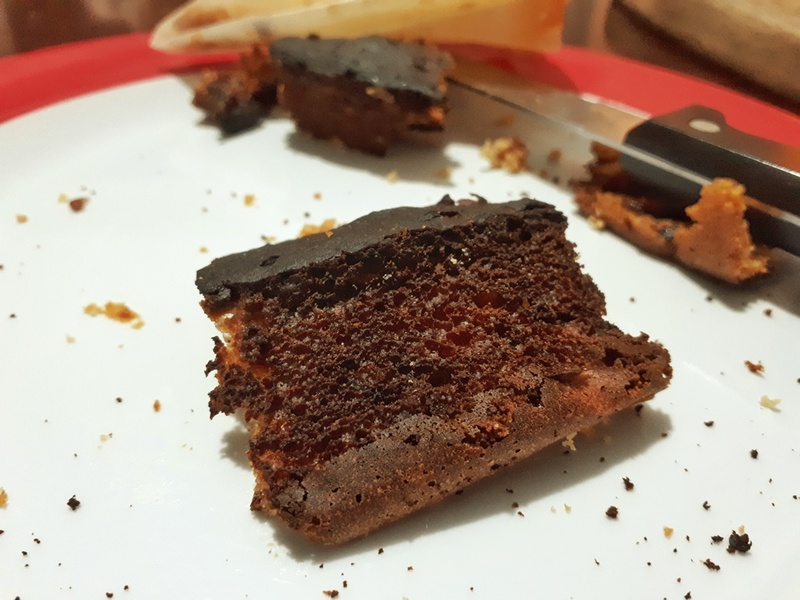 Now I wouldn't say this cake burnt too badly, cut the one bit of crust off and it's fine. But the kids have done nothing but go on about "daddies burnt cake" all weekend, even though they ate the whole thing! I guess it means I don't burn them very often, but it has slowly started to wind me up when they're just talking to anyone and they bring it up unprompted. "How was your ballet show yesterday?" "Pretty good. Dad burnt a cake though..."
Looks like I need a bit more practice with this oven but I'm sure I'll get there pretty quickly with it. Anyone else make one mistake that the kids keep going on about? Don't take it to heart. I suspect they are glad to have something derogatory to say as they don't get the opportunity very often. You are just their hero who is human. There's plenty of opportunities honest! Actually, can you smell it cooking? I've burnt more things than I'd like to admit because you can't smell it in a Rayburn and you just find the charred heap when you open the door! I have a 'cold plain shelf' which helps. It came with the stove and you keep it cold then slide it in above whatever it is you're baking to reduce the temperature and (in theory) stop the cake burning on top. In practice I still find cakes tricky. Maybe I need more practice?! I like the "burn it to learn it" phrase! That's my excuse from now on! I couldn't smell this burning though so maybe like hazel said the door is too well sealed. The cold plate sounds a good idea. I have a pizza stone and wonder if that would do the same. More practice needed! That is a KING of a stove! A little bit envious I will admit. I love it and I'm sure you would as well. Can't wait until I'm in the kitchen properly. I always wrap my fruit cake tin with thick news paper, this slows down the cooking, ensure the paper is higher than the tin, I then rest greaseproof paper on top, it just slows cooking down. Good idea! This tin was a bit short so I don't think that helped. Hopefully with the new kitchen and a bit more space I'll get a few different sized cake and pie tins as we don't have huge numbers here! Not so much a mistake but the first time we came to France on holiday the kids were four and eight , we had a lovely holiday beautiful beaches ,a nice gite . What did they talk about incessantly when we got home the rat they saw in the village street , all that way and the thing they remembered was the rat . Ha! That made me laugh! Like a childhood memory where the windscreen wipers broke. I have no memory of the trip to France & Germany but remember clear as day mum and dad using string to pull the wipers one way then the other. A rat though, that would have stuck with me as well! That windshield wiper story made me laugh out loud! It is this sort of thing children remember: We moved cities when I was three. My wonderfully organised Mother planned to turn the leftovers from the previous night's beef casserole into a meat pie for dinner. She'd picked up what looked like her usual packaged puff-pastry at the shop. Oh dear, it wasn't. That night's sweet pastry meat pie was inedible, with all of it being sweet. We never let Mum forget - my Sister even re-told the tale while giving the Eulogy at dear Mum's funeral earlier this year! That made me laugh as well! doesn't sound a great tea. Did she see the humour in it? Reminds me of a time dad brought some leather jackets that we will never let him forget! Dear Mum did end up seeing the funny side, in fact she was the one who told me that the sweetness went right through the pie filling too. I don't actually remember it, but I do remember the following year when dear Dad made pancakes, tossing them to keep a 4 year old me amused (dear Mum was unwell and in bed). One landed across a cupboard door handle and another stuck to the ceiling! Hopefully it will just take you a while to 'learn to drive' the stove. There tends to be a lag between the fire and the oven temperature, slow and gentle does it. Maybe trying too many new things at once. Try some old favourite recipes first. You could get an oven thermometer to calibrate it - sometimes the ones in the door are not very accurate. I'm getting used to it but until I get into the kitchen properly I'm not lighting it that much. I imagine after Christmas it will get used a whole lot more! The thermometer is something that I wondered about. my friend has a laser for taking temperatures so maybe I'll try that! Alas, time gets int eh way. I've been concentrating on other things of late but promise to post more on here soon. the four medians I use can't all be different all the time and there will be some overlap. But I will try to post more on here when I can.